Easy to carry with convenient handle. Oreck Commercial U2000R-1 Upright Vacuum. At 8 lbs., The Oreck Commercial U2000R-1 is Oreck’s ultralight Commercial upright vacuum. The Commercial U2000R-1 has a low profile design which allows it to lay virtually flat, making it great for vacuuming under furniture without damage. The side brushes are great for gathering up pet hair and dirt, especially around baseboards or furniture. The Oreck U2000R-1 has an extra long 40 foot power cord so you don’t have to switch outlets often. Cord guard prevents cord damage. Its powerful high speed double helix brushes brushes whirl at 6500 rpm. For convenience the vacuum has a fingertip-controlled on/off switch. The Oreck Commercial U2000R-1 is durable and built to last, made for commercial settings where the vacuum may be used for hours daily. Clear, non marring bumpers and soft wheels. For use on all surfaces: carpet, wood, laminate and tile. The Microsweep Feature allows you to switch from carpet to bare floors with no manual height adjustments. Hygienic Dustbags: The Commercial U2000R-1™ uses disposable bags for cleaner air as you vacuum. The 3 layer 630 cubic inch large capacity bag has the Celoc Hypo-Allergenic Filtering System. This helps to filter out dirt, dust, and allergens. Antimicrobial protection inhibits the growth of bacteria, mold, and mildew. 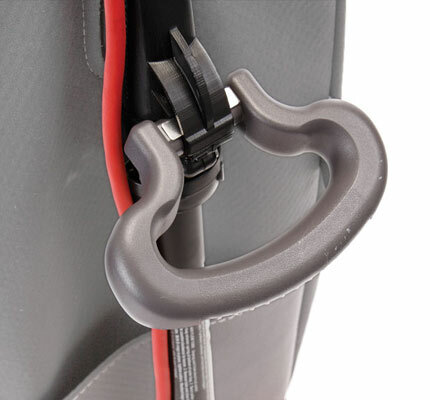 Saniseal® bag-docking system makes changing the bag a easy. Bag seals as you pull it off the vacuum. Top-fill design keeps power at maximum even while bag fills. Lightweight design makes it easy to carry the vacuum up and down the stairs and easy to push. Oreck Vacuum Cord Length: 40 feet. Smart-Review Commentary: The Oreck Commercial U2000R-1 is one of Oreck’s lightest vacuums and least expensive. A large handle on the back of the vacuum makes it easy to carry up the stairs. Because of its sleek design, the vacuum can be laid flat for vacuuming under furniture. If you are vacuuming for hours in a commercial environment, you will appreciate the light weight of this vacuum. Its easy to carry upstairs. The Saniseal dust bags snap into place for a sure lock, and seal the dirt in when you remove them, as well as filter out allergens. The Oreck Commercial U2000R-1 vacuum was Certified Gold by the Carpet & Rug Institute (CRI). This vacuum has automatic height adjustment, using the Microsweep Feature for easy transition from carpets to bare floors, so the only thing you need to do to use this vacuum is turn on the power switch. The Oreck U2000R-1 has an extra long 40 foot power cord, so you won’t need to change outlets often. This is an excellent lightweight vacuum, if you don’t need an extension hose built-in to your upright. This model has received outstanding consumer reviews and is a Smart-Review top pick in the bagged upright vacuum category.